The Memphis Group was a Italian design and Architecture group formed by Ettore Sottsass in 1981 the designed Post Modern furniture, fabrics, ceramics, glass and metal works from 1981 to 1987. The group's work often included laminate plastic and was characterized by ephemeral design using colourful decoration and asymmetrical shapes. On December 11 1980, Ettore Sottsass organized a meeting with designers and formed a design collaborative they named Memphis. The song had been named after Bob Dylan's song "Stuck Inside of Mobile with the Memphis Blues Again" which was played repeatedly throughout the meeting. They drew inspiration from art movements such as Art Deco and Pop Art. 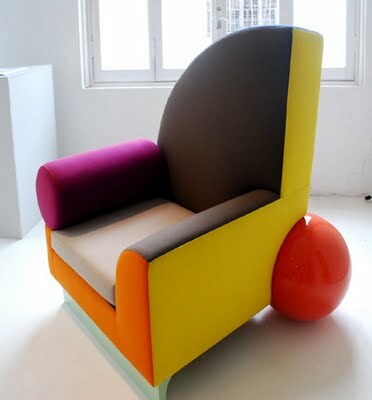 The group produced and exhibited furniture and designs annually from 1981 to 1988, which resulted in their debut at the 1981 Salone del Mobile of Milan, the world's most prestigious furniture fair. Sadly Ettore Sottass left the movement in 1985 and the whole group disbanded in 1988. A very abstract looking chair with quite unique geometry. A cool lamp design straying from traditional lamp to make an interesting shape. A cool shelf design with quite unique shapes and colours making another interesting piece. This is a room full of memphis group inspired furniture.